In Wanted, you play an Old West sheriff, a pure lawman in a time of raging lawlessness. You roam through seven stages of sweaty hell – Tombstone, the Desert, the Saloon, the Hotel, and other seedy places of interest – shooting almost any and everyone you see. There are four types of folks: bandits with their guns drawn; pedestrians who may or may not shoot you, depending on their mood; ladies of the evening; and cowards with their hands up. If you shoot anyone who doesn’t have a gun pulled on you, some of your health will be taken away. 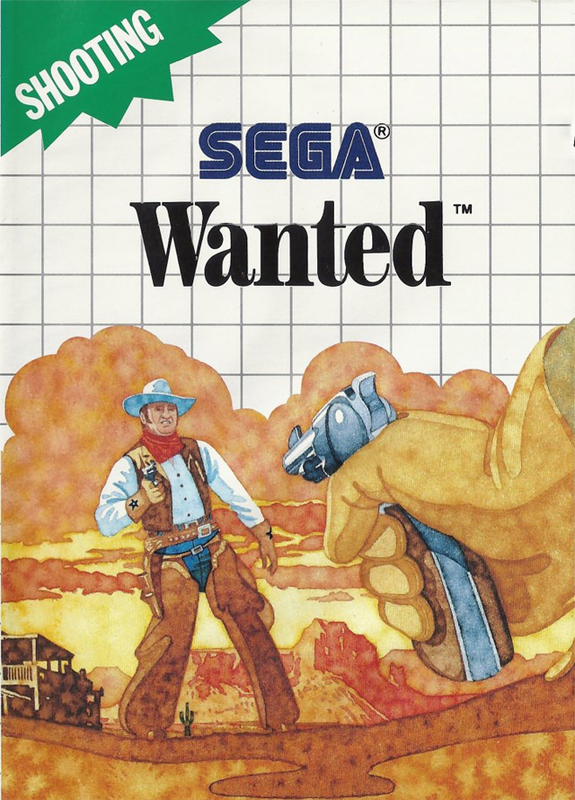 If you shoot those who do have a gun (and dear Wayne, there are a lot of gunslingers), including the boss at the end who can sustain up to nine bullets, you’ll be rewarded with sacks of cash and a horse to take you to the next town. Keeping the peace doesn’t come cheap. Only fools drink at Bar Mary’s. 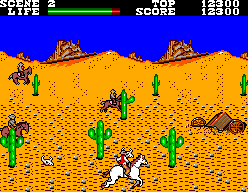 There are three types of stages: walking stages where you meander slowly through your environment and eliminate the troublemakers; riding stages, where you ride fast on your horse and shoot other riders; and challenge stages which allow you to hone your shooting and accuracy skills with a limited amount of time and bullets. Three difficulty levels are provided for you to test your mettle, but unless you fancy yourself an Eastwood-in-training, stick with Level 1. Yes, it’s the easiest setting, and it’s the only way you might make it through the riding stages, which are gul durn near impossible. The riding stage scrolls quickly and the riders ride by 2-3 at a time, shooting as they go. Enemy sprites are tiny, making them hard to shoot, yet it’s always easy to absorb their bullets. There’s also the occasional standing shooter who will take off an extra chunk of your lifebar if you don’t shoot him first. Thankfully, Wanted provides unlimited continues up until stage 6. Fail as much as you want, but get back on that horse, pilgrim. There’s sacks of money with your name on ’em. Wanted has bombs that, once shot, will take out any outlaw within a certain radius. The more outlaws killed by the bomb, the more life you’ll recover. This is a nice feature, and it’s the only one of its kind you’ll find in Wanted. There are no other items, like life or better guns. You can shoot the occasional background object – barrels, windows, and the like – but that doesn’t provide anything other than a cheap thrill. Shoot the guilty folk, leave the innocent behind, and move on to the next station. It’s a lonely, depressing life. After the sun has set and hundreds of outlaws have been buried in unmarked graves somewhere in the desert, Wanted is just plain uneventful. You shoot lots of people and lots of people shoot at you, yet it feels like nothing really happens. The riding stages are the most energetic areas, but they’re hampered by skull-rattling difficulty made only marginally better by unlimited continues. The Old West deserves better. Saddle up, friend, and stay far, far away from these parts. 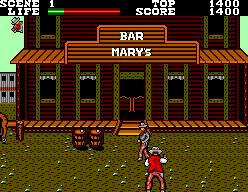 When I was a kid, this place we’d go out to eat at had a Sunset Riders arcade machine. They had a Mortal Kombat machine as well but it was always broken so my brother and I would waste my parents quarters playing Cowboys. That has nothing to do with this game, but this game kind of reminded me of how much I want to play Sunset Riders again. The Master System is like an old girlfriend. You remember all the great times you had with her, but then the more you think about it and the more you recall. The more you realise it was never that great in the first place and why you moved on. I honestly didn’t realise the Master System library was so mediocre. Nothing offensively terrible but only 2-3 gems a year but I suppose in those days you only got 2-3 games a year so as long as you picked well – no problem ! Really enjoyed this review Dylan it was truly more entertaining than the game itself. Thanks Sut! Yeah, I remember being so excited to jump from the SG-1000 to the Master System, but I’m more than ready for the Master System days to be over. Or if not over, sprinkled with Mega Drive, Game Gear, etc. I think it was pretty fresh for 1986, but by 1989 it was showing its age, and no A tier games support behind it. I can tell you by 1989 I too was extremely ready to jump onboard with Genesis. It’s obvious that’s where Sega;s talent went. Although your last SMS game this year is a gem. I would say that since you didn’t beat Wonderboy in Monster Land, to review the last level and ending on YouTube or something, the beggining of Wonderboy 3 is a direct callback to that. Which doesn’t have as much impact if you hadn’t played the second game. 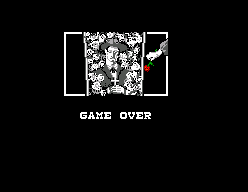 The first use of a game that has you replaying the last level and end boss of the previous game (Abliet in much easier form) to set up the first level of the sequel. I actually started Wonder Boy 3 tonight. Had to stop because I’m exhausted and I want to play it fresh. The intro was great, though!